As much as I love tea, and would be more than happy to drink almost any tea you could put in front of me, I must admit that I am not typically a fan of flavored teas. Most of the time I find them to taste artificial, with the flavor overpowering the natural flavor of the tea leaf. 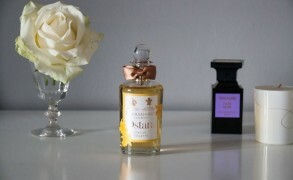 However, many tea-loving Bois de Jasmin readers have recommended various flavored blends from Le Palais des Thés. My curiosity was piqued and, eager to test these teas myself, I ordered the Teas and Flavored Blends Box Set. Much to my delight, all of the teas are scented delicately enough to accent the flavor of the tea, but strongly enough to be clearly tasted. I like some more than others, but overall, I’m happy with the purchase. The beautifully boxed set includes twelve screw-top metal tubes that each contain enough tea to prepare about six cups. Also included is The Théophile Guide, a small paperback book complete with detailed information about tea history, preparation, and detailed descriptions of all the teas sold by Le Palais des Thés. I found the samples to be generously sized and conveniently packaged, with brewing time and temperature labeled on each one. All in all, this set would make an excellent gift for a tea lover, and could be equally appreciated by someone new to tea or to a seasoned tea drinker. Below are my impressions of each tea in the set, which includes Thé des Moines, Thé Vert à la Vanille, Thé du Hammam, Fleur de Geisha, Thé des Fakirs, Thé des Alizés, Thé des Amants, Blue of London, Thé des Lords, Thé des Sables, Thé des Concubines, and Thé des Songes. One of my favorites in the set, this blend is said to be inspired by an ancient recipe handed down by Tibetan monks. The tea consists mainly of black tea, and is infused with an intoxicating, complex floral aroma dominated by orange blossom. What I liked about this tea the most was that it includes a floral aroma that is very different from the jasmine-scented teas to which I am accustomed. This tea is great served hot, but is also especially excellent as an iced tea. When I first smelled this tea, I wasn’t very excited by it, and subsequently left it as one of the last I tasted. I now realize that I shouldn’t have, because this tea is utterly delicious. The creamy vanilla flavoring harmonizes beautifully with green tea. The combination is simple, but really holds its own even in comparison to some of the more complex blends in the set. This green tea, blended with flower petals, is flavored with an enchanting blend of rose, green dates, orange blossom, and red currant. As the name suggests, this blend is inspired by the relaxing scents of a Turkish hammam. This was another favorite of mine from the set, and when I first tasted it, I immediately felt like I was being transported to the serenity of a hammam. As such, I can immediately understand why this is one of the most well known and bestselling blends from Le Palais des Thés. For more information on this tea and its matching scented candle, please read Victoria’s review here. Fleur du Geisha is another brilliant scented green tea, in this case accented with a floral cherry flavoring. This tea pays tribute to the Japanese tradition of Hanami, the springtime contemplation of cherry blossoms. Like Thé du Hammam, I found this tea transporting and addictive. It is simple and pretty, with the bright flavor detracting nothing from the delicious green tea base. This tea strikes me as a fresher tasting alternative to more typical spiced chais that are usually black tea based. Instead, this one consists of green tea accented with cardamom. A slight citrusy note gives this blend a fresh and zesty taste. This blend consists of green tea with a fruity scent that is reminiscent of peach and kiwi. This blend is the fruitiest of all the teas in the set, which would normally be a deterrent for me, but I found the fruit flavor to be delicately balanced with the tea, not overpowering. I imagine this would probably make a very refreshing iced tea. This spiced black tea is layered with the flavors of vanilla, apple, citrus, and spices, and strikes me as a perfect tea for wintertime. Though Le Palais des Thés sells a special tea for Christmas, this tea would work for any winter holiday as well. The spice and citrus theme is very common for spiced black teas, so the addition of a prominent apple flavor was a welcome change of pace. An interesting and multifaceted Earl Grey. This tea showcases an especially fine Calabrian bergamot, set against a lighter base of Yunnan black tea. The result is a classic taste, reinterpreted as fresher and subtler, yet also more complex. If you like Earl Grey but want to try something a little different, this is a good choice. This is a refined Earl Grey, with a strong bergamot note that tastes classic and immediately recognizable. The black tea is attractively mixed with scarlet safflower petals, which heightens the visual appeal of the leaf. This tea is in no ways sub-par, but it doesn’t stand out to me as unique. I much preferred Blue of London. Nonetheless, this tea is a perfect choice if you are looking for a traditional Earl Grey tea. This Moroccan-inspired green tea is scented with rose, citrus, and fruity, peach-like notes. It didn’t stand out to me as much as other flavored blends in this set, but it is somewhat similar to Thé du Hammam in that it plays off a similar fruity rose theme. However, I find that in comparison, this tea lacks the rich smoothness and subtle sweetness that I like so much in Thé du Hammam. Thé des Concubines is a blend of black and green tea with a red berry flavoring. Of all the teas in this set, this one was one of my least favorites, along with Thé des Songes, which plays on a similar theme. To my tastes, the blend of black and green teas tastes dissonant, and rather than harmonizing with the complex floral berry flavoring, somewhat detracts from it. This tea is head and shoulders above the majority of mainstream flavored teas I’ve tried, but it didn’t impress me as much as others in the set. Unfortunately, I wasn’t a big fan of this tea either, and since it’s similar to Thé des Concubines, I wonder if I simply don’t like the combination of a berry flavor with a dark (non green) tea. Thé des Songes is an oolong tea with a red berry flavor that is less complex than the one featured in Thé des Concubines. The oolong tea tastes much smoother than the black and green tea blend in the former tea though, and if I was given a choice between this tea and Thé des Concubines, I would choose this one. What are your favorite flavored teas? Le Palais des Thés Teas and the Flavored Blends Box Set are available at their boutiques and online, $65 for a sampler of 12 teas. Jillie: Thank you for your lovely review, which of course has made me want to try these teas. I am certain that my favourite too would be the Hammam, as those notes appeal to me the most. I like Dilmah flavoured teas as they seem to have a good natural taste, and I am at this very moment really enjoying their Peach – peach (like apricot) seems to complement tea so well and its happy fragrance reminds me of that thing we used to call the sun! Andy: Jillie, I’m sure you’d love Thé du Hammam, it is truly exceptional. Its rich scent and flavor are absolutely irresistible! Peach can be a very nice added flavor in teas, especially for oolongs, which often have naturally occuring fruity facets. I’ve never tried Dilmah teas, but I can remember having a peach tea from Tea Revolution that was pretty good. behemot: Dilmah teas are resonably priced and quite good. Jillie, have you tried the caramel one? I like it a lot. Andy: You’re very welcome! I was just the same—I’d had my eye on this set for a while, and finally decided to go ahead and buy it. And I’m very happy I did! It was a great way to acquaint myself with the Le Palais des Thés brand, as many of the teas in the set are some of their top sellers. Andy: Ultimately, I drink tea because I like the taste, but the health benefits are a nice added bonus. The immune-boosting, mood-lifting, and antioxidant properties of tea are all a huge plus! Andy: Glad you enjoyed the review! Those three teas you’ve mentioned are all really excellent—must try, I would say! Beth: I had never thought of a sampler pack for Teas. Of course, I’m just now getting into them, since I was told I cannot have coffee anymore. I had never been a tea person in the past, but it is growing on me. My favorite right now is a Harney and Sons Cinnamon tea. It’s got enough Oooomph to make me not miss coffee. I’m hoping I’ll grow to love the subtler blends the same way my nose has grown to love the complex perfumes over time. Austenfan: I was glad to see that the Thé des Moines was a hit. Mine is sitting in it’s tin waiting for warmer weather. I like some of PdT fragranced teas. Blue of London is very good and I am quite partial to Thé des Lords as well. Still, for the sweeter flavoured teas I prefer Mariage Frères. They seem somewhat more refined. Andy: Thank you for recommending the Thé Des Moines as an iced tea—that was a truly great discovery. In the summer, I’d like to make a pitcher and add a handful of Sambac Jasmine flowers to it, just to add even more floral depth. I have yet to try Mariage Frères, but I am eager to soon. Many of their offerings sound exceptional. Rose D: I so want to try Fleur de Geisha! Green tea is usually my No. 1 pick and I love cherry blossoms. For years, I have been trying to find a perfume that depicts cherry blossoms as truthfully as possible, and I am still searching.